Hello and Happy Tuesday! Thanks for stopping by, I hope today has found you well. It was quite cold, even down right frigid here in CNY, but on the plus side, it didn't snow and it didn't rain, 2 things we have had WAY too much of around here. Don't get me wrong, seeing all the sadness out of places like Cali, with the fires and devastation that they have experienced. I don't like to complain about it, but I will just say, I was grateful for today. Anyhoo, I have a fun project to share with you all today that I made during my Facebook Live over on my business page (check it out if you'd like). 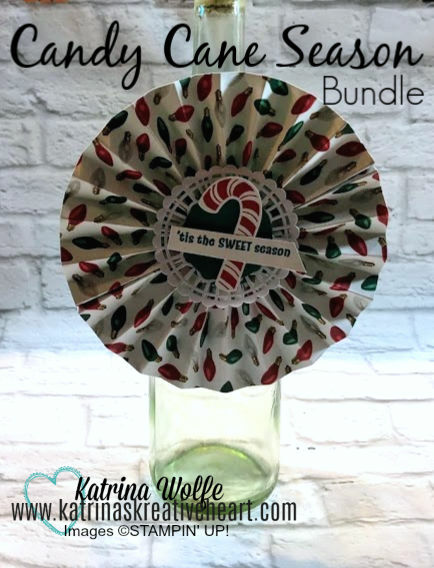 It's a fun Wine Bottle tag I made using the Candy Cane Season bundle from the 2018 Holiday Catalog. And not only is it a fun tag, but it's very quick and simple to put together. To start, you will need 2 pieces of Designer Series Paper cut 3" x 12" (I used the All is Bright from the Holiday Catalog) and you will score it the entire length at 1/2" intervals. Once you have all your scoring complete, you will accordion fold both pieces. Add Tear & Tape to the ends of one and adhere the 2 pieces together to create the "rosette". 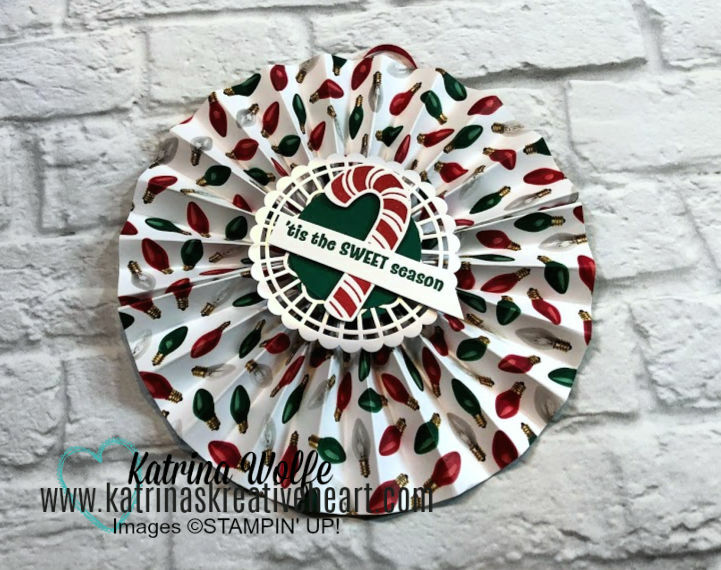 Punch out 3 circles using the 1 3/4" Circle punch from Shaded Spruce cardstock, add hot glue to 2 of them and place on the front and back to hold the "rosette" in place (be sure to add your ribbon loop to the back circle before you place it onto the "rosette". Next, layer a Pearlized doily and the 3rd circle punch to the front of the "rosette" and stamp the candy cane in Real Red ink onto Whisper White and punch out with the coordinating candy cane builder punch. Add to the front of the tag with mini Stampin' Dimensionals. Then stamp the sentiment in Shaded Spruce ink onto scrap Whisper White and cut down and add an angle to the right end and add to the tag with Dimensionals. You are now ready to suspend your tag from a bottle of wine or a gift package or even use as an ornament on a tree.